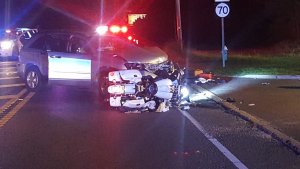 On Saturday night, September 9, 2017, at approximately 8:44 PM, officers from the Manchester Township Police Department responded to the area of Route 70 near the intersection of County Route 539, in the Whiting section of the Township for the report of two vehicle crash involving an SUV and a motorcycle. 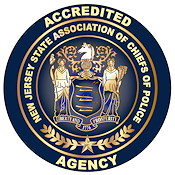 Upon arrival, officers located a 2006, Chrysler Pacifica and a 2006, Yamaha Royal ST motorcycle in the eastbound lane of Route 70 adjacent to the entrance to the Wawa convenience store. The Pacifica had extension front end damage and the motorcycle was lying on its right side in front of the SUV. The initial investigation revealed that the driver of the Chrysler Pacifica, 25-year-old Katelyn Desaules of Toms River, was attempting to make a left-hand turn into the Wawa from Route 70 westbound when she struck the Yamaha motorcycle, which was being operated by 59-year-old, Gary Quatrano of Neptune in the eastbound lane. Further investigation revealed that Quatrano, who was traveling eastbound on Route 70 at the time of the crash, had failed to properly secure his helmet chin strap, causing it to become separated from his head at impact. Quatrano was transported to Jersey Shore University Medical Center in Neptune, where he later succumbed to his injuries. Desaules sustained minor injuries and was transported to Community Medical Center in Toms River for treatment and evaluation. Assisting at the scene were detectives from the Ocean County Sheriff’s Office Crime Scene Investigations (CSI) Unit and the Ocean County Prosecutor’s Office Fatal Accident Support Team. Also assisting were firefighters from the Whiting Volunteer Fire Department, EMTs from Quality Medical Transport and paramedics from MONOC. Assistance with closing the roadway was provided by the New Jersey Department of Transportation and the NJSP Traffic Diversion Team. The roadway was closed for several hours while officers conducted the investigation and the roadway was cleaned up. This crash is currently under investigation by Patrolman Thomas O’Hare of the department’s Traffic Safety Unit.